I’m adding this recipe mainly for the Dutch since Americans just use their mothers’ recipes, and Americans whose mothers didn’t make cornbread tend not to eat it. The recipe’s from my mother, who got it from her mother, who doubtless got it from hers. It’s the standard East Texas recipe and is typical for the southern United States. Northern cornbread is very different, typically having a much higher ratio of wheat flour to corn meal and way too much sugar. Grandmother upgraded from a wood stove to a gas stove not long before I was born when gas, electricity, and indoor plumbing came to town. In gas ovens, the heat comes entirely from the bottom. 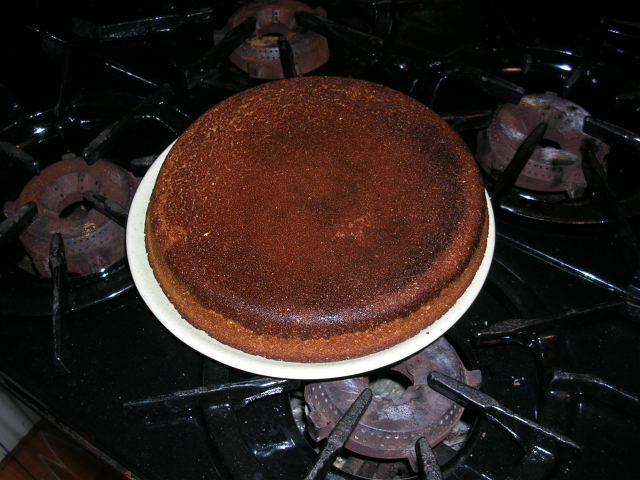 Electric ovens tend to burn the top before the cornbread is cooked through unless you set them so that only the bottom element is working. This will also help keep the cornbread from sticking to the pan, but it wants very badly to stick and will do so at the slightest opportunity…as my Dutch friends can confirm. 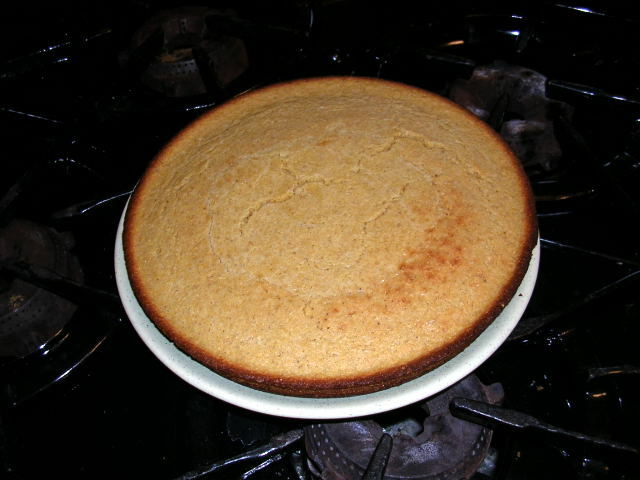 Traditionally, cornbread was cooked in an 8 inch (20 cm.) 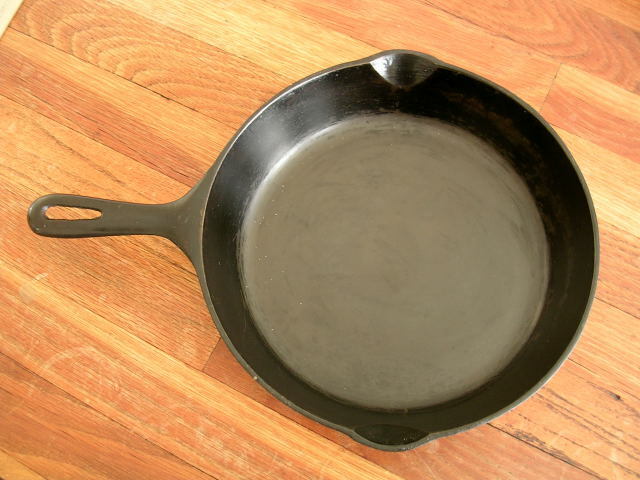 cast iron frying pan. You can double the recipe and use a 10 inch (26 cm.) pan as seen above. I still use these pans, and if they are kept properly “seasoned,” the cornbread does not stick during cooking. The principle is the same as with the standard French iron omelette pans. If you wipe them out with paper towels and salt after use and do not scrub them with detergent, they will develop a relatively non-stick surface. However, most people now use some kind of non-stick modern pan because they require less care. Then again, I look at my collection of modern pans with the non-stick lining mostly gone and realize, yep, I ate that lining over the years. Well, and served it to my friends. Late Heretical Note: After fussing with those iron pans all my life, I have discovered that a Pyrex® (oven-proof glass) pie plate or square baking dish is actually better for baking cornbread than the traditional iron frying pan. The crust turns out more even, the cornbread doesn’t stick, and the glass pie plate is much easier to clean and take care of than the iron pan. I told my sister about this and she was aghast that I would even think of using anything other than the “proper” pan. I didn’t push it for fear she’d have me committed. Later Heretical Note: Grandmother is turning in her grave, but I’ve been tweaking the recipe and have discovered that most folks like this bread even more if i use, for a double recipe, 2/3rds c. flour, 1 1/3rd c. cornmeal, 3 T. sugar, 1 1/2 t. baking powder, 1/2 t. soda, 1/2 t salt and 2 beaten eggs plus enough buttermilk to make 2 cups of liquid. And of course 4 T. melted fat. I find this a good compromise between the more rugged and savory original version and that sweet cake the Yankees pass off as cornbread. European recipes typically measure fluid ingredients by volume and dry ingredients by weight, but American recipes usually measure everything by volume. This can get little confusing for Europeans (and for that matter, many Americans) because we use the word “ounce” (abbreviated “oz.” and no, that is NOT a typo) to describe two different measurements, the fluid ounce (measured by volume) and the dry ounce (measured by weight). There is one substance on the planet for which the number of ounces by volume and by weight is the same: water. A pint of water is 16 fl. oz and also weighs 16 oz. Fluid ounces (abbreviated fl. oz.) are normally measured by the cup (abbreviated “c.”, which is 8 fl. oz.) and fractions of cups; and again, we use these “fluid” ounces to measure both liquid and dry ingredients. For smaller amounts, we use measuring tablespoons (abbreviated “T.”, which is ½ fl. oz. ), measuring teaspoons (abbreviated “t.”, 3 teaspoons = 1 tablespoon), and fractions of teaspoons. Our measuring tablespoon holds a bit more than the Dutch eetlepel, while the Dutch teelepel is a bit more than our measuring teaspoon. Corn meal is a grind halfway between corn flour and the coarser grind used for polenta. I’ve been taking my own cornmeal to Amsterdam, but next time I plan to do some serious hunting for a Dutch equivalent. You could also just zap the polenta grind in a blender to get it down to the right size. The cornmeal should be made from the whole grain of “dent” corn, which is not the same kind of corn that is eaten as a vegetable but rather the corn used for polenta and tortillas. Whole-grain cornmeal is more difficult to find because it spoils fairly rapidly unless it is refrigerated or at least kept cool. Nowadays, most people use cornmeal from which the “germ” (containing all the fat and many of the vitamins) has been removed so that the meal will keep for years like white flour. Whole-grain cornmeal tastes better and is more nutritious. Soda is pure sodium bicarbonate (natriumbicarbonaat in Dutch) and also helps make the bread rise in the acid environment provided by the buttermilk. I never saw this in Albert Heijn. I did see it, though, in San Andrecito, formerly on Spuistraat but in 2007 moved to Nieuwe Nieuw Staat 16 but with a miserably poor food selection compared to its Spuistraat days. I’ve also bought it at Wah Nam Hong at Geldersekade 90. In the past, I took my own soda and baking powder to Amsterdam, but I’ll be buying them locally now since these are not good times to be transporting through airports plastic bags full of white powders. What most folks do nowadays is substitute a good oil – like canola oil or tastier yet, sesame oil – for all or at least some of that saturated fat. Beat one egg well in a measuring cup. Then stir in buttermilk (Dutch karnemelk seems to be the same thing) until you have 8 fl. oz. (240 ml.) of liquid. Set aside. This is done as the first step so that the liquid ingredients can get closer to room temperature. Preheat the oven to 425 Fahrenheit (220 Celsius). Mix ¾ c. or 6 fl. oz. (180 ml.) corn meal and ¼ c. or 2 fl. oz. (60 ml.) wheat flour in a large bowl. I’ve used all-purpose white flour, whole-wheat flour, and even cake flour. They all seem to work, but I prefer whole-wheat flour. So does my doctor. Note that this ratio of cornmeal to flour is the traditional ratio rather than the improved ratio I describe above for a double recipe. Add 1 T. (15 ml.) sugar, ¾ t. baking powder (3,75 ml. ), ¼ t. soda (1,25 ml. ), and ¼ t. salt (1,25 ml.). Stir very well. You can do all of the above steps a couple of hours ahead of time, but the remaining steps should be put off until about 40 or 50 minutes before you want to serve the cornbread. For an explanation of why, see “Hot Breads and Nazis” in Amsterdam by Foot . Put 2 T. (30 ml.) of “bacon drippings” or one of the above substitutes into the cooking pan, and put the pan into the oven for 4-5 minutes to heat the pan and melt the fat. When the fat is melted in the hot pan, mix the above wet and dry ingredients well and then rapidly mix in the melted fat. Immediately pour the batter into the still-hot pan and put the pan into the oven. Cook until the top is “golden brown” and the bread is cooked through. The bottom crust will be a darker brown. This will take approximately 35 minutes. Dump the cooked cornbread onto a warm platter and cut it into serving pieces. You may need to run a flexible instrument of some sort around the edges and underneath the bread if it has stuck to the pan. Serve immediately while it is still too hot to eat. In the old days, we would put butter on it, but nowadays folks don’t eat so much butter…or know we shouldn’t eat so much. I really enjoyed your summarizations and little quips about cornmeal, the different measurements, explaining about the ingredients and other stories. How your Grandmother would feel about you tweaking her original recipe. I think she would be proud of how much passion you put into wriiting about her recipe. Thankyou for the additional information. Many thanks to you for your kind remarks. Do try that recipe, especially if you incorporate the tweaks. Oh, and my sister is utterly horrified that i would consider, much less recommend, baking cornbread in anything other than an iron skillet. This is a very detailed recipe indeed, well done. I’ll definitely use it for making corn bread the next time. Your recipe seems quite similar to Selena’s, except that she uses way more sugar. Perhaps because she’s from Detroit? Oh and she did use a pyrex dish! Praise from a cook as gifted as you inspires me to suggest a variation: just before you turn the oven on, slice speklapjes (or American bacon) crosswise into the cold pyrex dish and put the dish into the oven. As you mix the other ingredients, stir the speklapjes occasionally while they cook and render their fat. Then stir them and their fat into the batter instead of the fat called for in the recipe. Dump the mixed batter into the hot dish and bake it. The bits of meat in the bread make it even better. Oh, and those Detroiters sure do have a heavy hand with sugar. They even put it in beans!